Black silk velvet, white silk satin (for the partially modern collar), white satin appliqués embroidered with metal cannetilles and gold sequins. Elisabeth de Caraman-Chimay, Comtesse Greffulhe (1860–1952) made this dress famous by posing in it for the photographer Nadar in 1896. 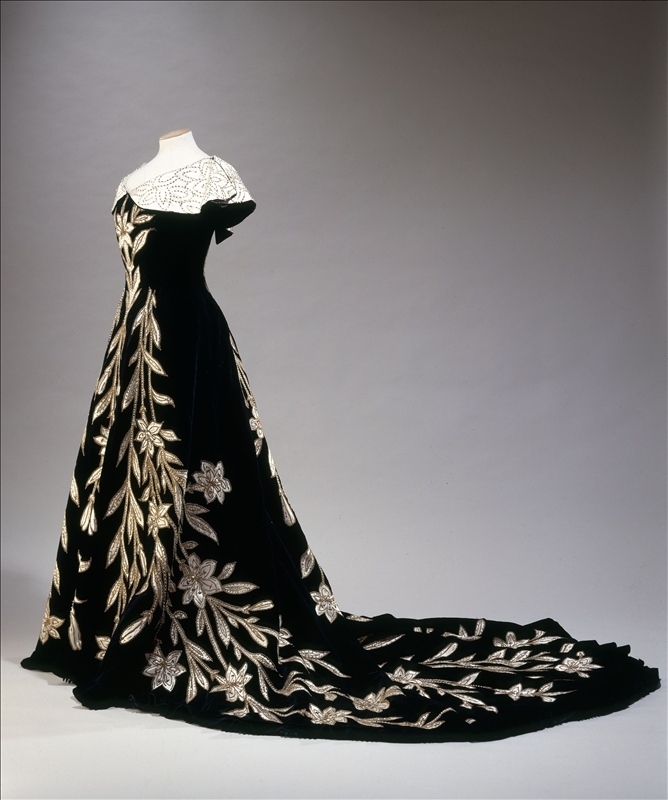 The museum also possesses the photographs made at the time, in which the elegant countess opted for being photographed in back view so as to highlight the slimness of her waist: this close-fitting 'princess line' dress – there were no seams at waist level – and the sinuous lines of the lily plants accentuate the impression of tallness and slenderness. One of the leading figures on the Paris social scene – not only for her rank and sovereign elegance, but also for her culture and intelligence – Comtesse Greffulhe was a significant source of inspiration for Marcel Proust, who used her as the model for the Duchesse de Guermantes in Remembrance of Things Past. She was also the cousin of Robert de Montesquiou, who drew on her for some of his poems, including a sonnet whose closing line Beau lis qui regardez avec vos pistils noirs ('Beautiful lilies gazing with your black pistils') doubtless refers to this dress. The « berthe » collar, whose original form was altered, certainly during its owner's lifetime, could be turned up to form bat's wings; a bat being Montesquiou's emblematic animal, what we have here is a true dress-poem. The Palais Galliera is fortunate to possess a substantial part of this elegant woman's wardrobe, donated by her family.